If you are looking for a stylish, comfortable vehicle for your daily commute or running errands around town, this is the bike for you. 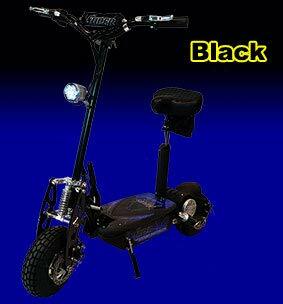 This little scooter travels quickly and quietly while offering maximum rider safety and comfort. The Super Turbo 1000 Watt Elite 36V scooter is manufactured by Super Cycles and Scooters, a company in the scooter business for over 12 years. This mid priced scooter offers a high quality product at an entry level price. The Super Turbo 1000 Watt Elite 36 V scooter is one of the models available from Super Cycles and Scooters, a Myrtle Beach, SC company specializing in scooters for recreational and commuter use. The Turbo 1000 is their mid level bike, perfect for adult riders. The Turbo 1000 offers a top of the line 1000 W motor, more powerful than most other scooters available. This powerhouse of a motor allows the scooter to travel for 18 miles before needing recharged. The scooter is best used for smooth, flat surfaces such as sidewalks and asphalt, but the company offers an optional hill climb kit with a larger sprocket, if you need to travel on hilly terrain. The Turbo 1000 will carry a heavy adult (up to 250 pounds) for 18 miles at a speed range of 18-26 mph. Two power modes allow the rider to choose between econo mode for maximum distance and turbo mode for maximum speed, but less distance. The Turbo 1000 is made of durable steel parts and assembled in the USA. It has a sturdy deck, but the company also offers a super wide deck as an option. Front and rear shocks and extra wide 10.5″ rubber tires provide a comfortable ride, even over sidewalk cracks and rough asphalt. For riders who prefer a seated ride, the scooter has a removable seat post with an adjustable height comfort padded seat. None of those little hard plastic seats on this baby. Layers of foam cushion are wrapped in a durable cover. Seat heights adjust from 29″ to 35″, measured from the ground. The Turbo 1000 will accommodate riders of all heights. The Turbo 1000 has plenty of safety features. Front and rear disc brakes offer stopping power. A heavy duty sprocket and chain are durable and long lasting. A lighted display shows the battery life remaining and provides the switch for the econo and turbo modes. The scooter comes with a bright headlight, but the company offers an optional LED tail light and mirrors for additional safety. The right handlebar grip controls the twist type throttle control and a cable operated disc brake. The Turbo 1000 also has a key switch ignition and maximum security. The Turbo 1000 has a high powered motor that offers a speedy ride on any level surface. It folds so it easily fits in the trunk of a car. 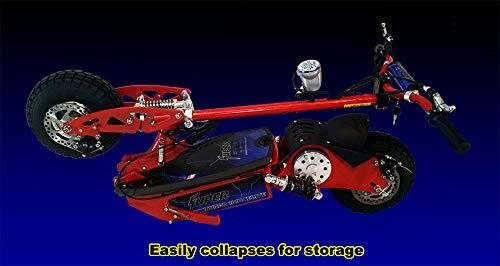 A steel frame and heavy duty chain and sprocket provide long lasting durability. 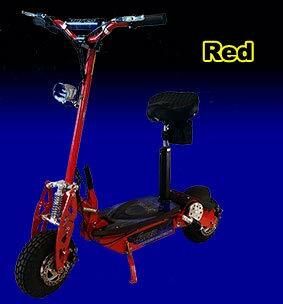 Features such as a padded seat, shock absorbers, and a wide deck offer a comfortable ride. Battery recharge takes about 6-8 hours using standard household current. The battery pack is easily accessible by lifting the deck. It is very easy to operate with the twist control throttle and hand operated brake. The 10 inch rubber tires carry you comfortably over sidewalk cracks and rough asphalt. The company offers a 90 day bumper to bumper warranty along with a 1 year warranty on the motor. The scooter is made of heavy duty materials so it weighs a hefty 92 pounds. It is only intended for riding on level surfaces, unless you purchase an optional hill climb kit. Other optional items that should be standard are the rear safety light and mirrors. Another item that is sold only as an option is splash guard fenders. These should be included, not optional. The modes are nice, but you should not have to choose between distance and speed. The Super Turbo 1000 watt Elite 36V scooter is affordable and long lasting. The 1000 W motor is strong enough to carry full sized adults at up to 26 mph. Rubber filled tires and spring shocks offer a smooth ride. A thick, padded adjustable height seat offers rider comfort. The scooter comes equipped with a LED headlight, and battery life display. Optional accessories include rear LED lights, safety mirrors, splash guard fenders, rear rack and storage bag, and wider deck. Deep cell lead batteries provide long life and charging takes 6-8 hours. Operation is easy with a turn key ignition and twist grip throttle. The company offers a warranty and excellent customer service and support.